We know many people with full dentures will struggle to eat and talk comfortably, which is why Dr Poulos is pleased to offer All-on-Four, a technique to replace a full arch of teeth using just four dental implants. Dr Poulos is trained and certified in providing Nobel Biocare’s All-on-Four® Treatment concept. Conventional techniques for replacing full arches of teeth often require multiple dental implants, resulting in a costly procedure that is out of reach for many. With All-on-Four®, Dr Poulos will insert just four dental implants in such a way that they are able to support a complete arch of teeth. Will I Be Left without Teeth during Implant Treatment? We know many people are worried about being left without teeth during treatment, but we’d like to reassure you that this will not happen. Dr Poulos will provide you with temporary teeth to be used during the healing process, so you will still be able to talk and eat without discomfort or embarrassment. The implants are placed towards the front of the mouth as this is where the jawbone is naturally thicker and stronger. By utilising the jawbone, the need for bone grafting is minimised. Two of the implants are placed vertically right at the front of the arch, with the other two being placed either side. These are tilted backwards at a 45° angle which enables Dr Poulos to use longer implant posts, providing greater integration with the jawbone. 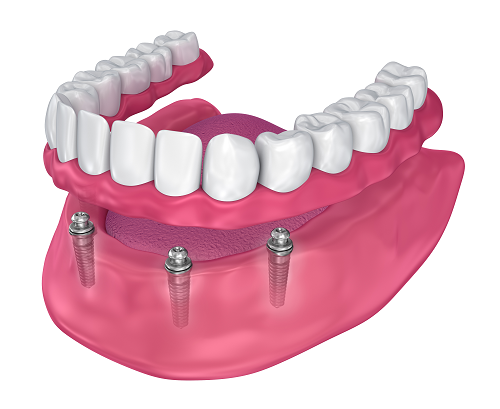 Once the implants have fully healed, they will create a strong and stable foundation that can easily support a complete arch of teeth.In some cases that demand additional treatment, the same full-arch restoration can be supported on six implants. Ask Dr Poulos if this process is appropriate for you. Please see our Gallery for some of Dr Poulos’ amazing All-on-Four® and full-arch restorations.